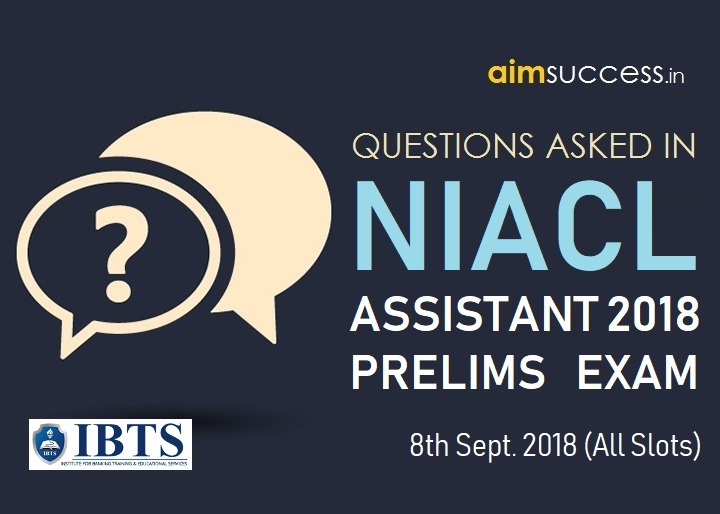 The Online exam for NIACL Assistant has been successfully concluded today i.e on 8th September 2018. We have compiled the Question Asked in NIACL Astt Prelims Exam Analysis 8th Sept. 2018 for you which will help you to estimate your chance of clearing the exam. It will also be beneficial if you are writing the exam in the upcoming shifts. Single Row Seating Arrangement - 6 people facing sitting in a single row, all facing North. Circular Arrangement - 8 people sitting in a circular fashion, all facing towards the centre. 13, 19, 31, 55, 103, ? 18, 48, 73, 94, 112, ? Data Interpretation : A Bar-graph DI was asked. : In this three years 2007,2008 and data of marks for two students A and B were provided. 1. Reading Comprehension: Story based reading comprehension was asked.There were two vocabulary based questions. He followed rigorous practices of worship even during cold, hot and rainy seasons. Due to this, his body had become lean and weak. His hair and nails also grew long due to his absence of maintaining them. One of his devotees gifted him with a pair of calves. He took great care of the calves and fed them properly. In due time, they grew enviable fat. One day, a thief noticed the calves and thought, "I shall steal these fat calves from him." He planned and returned with a rope to steal the calves in night. On his way, he met a demon with a very hideous appearance. The thief was frightened on seeing him and asked, "Who are you?" The demon replied, "I am a demon. I always speak the truth and hate liars. Introduce yourself!" The thief confessed, "I am a thief and I am on my way to steal two calves from a devoted Brahmin". The demon and the thief struck a friendship as they were both truthful to each other, and they planned that the demon can eat the Brahmin, and the thief can steal the calves. Their works will be accomplished in the same place, so they went together. The slipped inside the Brahmin's home and hid themselves. They waited for the Brahmin to fall asleep, when they would get the opportunity to accomplish their works. As soon as the Brahmin fell asleep, the demon came out of hiding and readied his teeth and nails to eat him. Fearing that his purpose will be defeated if the Brahmin wakes up when the demon goes to eat him, he asked the demon to wait till he tied the calves with his rope and left. But the demon disagreed, that if the calves started moo-ing when the thief was stealing them, the Brahmin may escape upon waking up, and his purpose will get defeated. They got into an argument due to this, and the noise of their argument woke the Brahmin up. The thief complained to the Brahmin that the demon was planning of eating him up. On this, the demon also complained to the Brahmin that the thief was planning to steal the calves from him. The Brahmin at once started praying chants. Hearing this, the demon ran off. Then the Brahmin took out a stick and chased away the thief. Linear Seating arrangement question in which some persons were facing North and some were facing south direction.Candidates needed to arranged 10 persons in a proper order as per the question. Square based seating arrangement with 8 person. 4 persons were sitting on corner and 4 on middle of the square. 1. Wrong number series was asked. 2. Data Interpretation: Tabular Chart based DI was asked.It The question was based on different organizations. 2. Cloze Test: Story based cloze test was asked. :In this a passage with blanks was given. Students were required to fill the blanks meaningfully from selecting the appropriate option. Q 1: Which is the most opposite word for 'Approach'? Q 2: What is the synonym of 'Rigorous'? Q 3: What is the antonym of the word 'Heinous'? Q 4: What is the antonym word for 'Exposed'? Q 5: What is the synonym of 'Fancy'? Q 6: What is the meaning of word 'Rigid'? Q 7: What is the meaning of word 'Laborious'? 2. How many meaningful words can be formed from 'BLTO'? 1. Data Interpretation: Line graph: Two line graphs were given in which data related to students appeared and passed were provided. 5 69 118 154 179 ? 19 55 163 487 1459 ? 7 15 39 87 167 ? 3. The age of the brother 8 years ago and the present age of sister is in the ratio of 18:11 and the sum of the ages is 74. What is the age of the brother? 4. In a jar, there is x liter mixture of milk and water in a ratio of 4:3. 10 litre water is added then water becomes 22 times of the mixture? What is the value of x? 5. The downstream speed of a boat is 7 more than the upstream spead and spead of the boat is 7 times the speed of the stream. How much time is taken by the boat to cover a distance of 120km downstream? 6. Two car start from the same point but in opposite direction having speed 31.5 km/h and 42.5 km/h respectively. Find the time by which distance between them will be 592 km? 7. A is 30 and B is 20% more than A and C is 25% more than B then ABC got 30,36,45 respectively then find the value of B and C? 1. Reading Comprehension : based on (shopkeeper wants to sell puppies) . There were two vocabulary based questions. 3. Error Spotting: The nurse knew just to do when a child weeps. 1. Data Interpretation- Tabular DI: A set of 5 questions from DI (Tabular DI, Bar Graph DI, Line Graph DI) , simplification/approximation, arithmetic word problems were asked in each of the shifts. 1. Reading Comprehension : Easy level story based RC was asked.There was one vocabulary question based on passage.